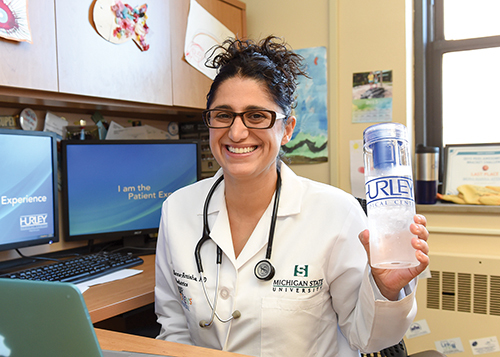 DEARBORN, Mich.—ACCESS, the nation’s largest Arab American community nonprofit organization, will present its 2016 Champion of Justice award to internationally recognized Flint-area pediatrician Dr. Mona Hanna-Attisha. The award will be presented at the ACCESS 45th Annual Dinner, the largest event of its kind in the U.S. with more than 2,000 attendees, taking place on April 23, 2016, at the Detroit Marriott at the Renaissance Center. WHEN: Saturday, April 23, 2016 at 6 p.m.
Dr. Hanna-Attisha is widely recognized as the whistle-blower who forced the state of Michigan to acknowledge toxic levels of lead in Flint’s water supply, and has been the voice of the children of Flint throughout the crisis. She has appeared on CNN, MSNBC, BBC and countless other media outlets championing the cause of public health and encouraging others to join her in providing assistance to Flint’s residents. To learn more about the dinner, follow the links below or visit www.accesscommunity.org. For more information on the ACCESS Annual Dinner, contact Nissrine Hussein at 313-842-4748, or at nhussein@accesscommunity.org. Tickets are available here until Wednesday, April 20. *Media interested in attending must check in at registration the day of the dinner. Grounded in a grassroots commitment to serving our community, ACCESS has a 45-year history of providing health, education, employment and social services. An Arab American nonprofit of excellence, ACCESS empowers communities in Southeast Michigan to improve their economic, social and cultural well-being and extends this mission nationally through advocacy, arts, culture and philanthropy.